Disclosure: I received the Studio Art Desk for review from Step2. All opinions are my own. I can't believe that it is already August! That means Back to School is just around the corner and even though Kenzie has to wait another year for Kindergarten (since her birthday is past the cut off for transitional Kindergarten although she is academically ready), a new desk for all her current studies from Step2 got her excited. Kenzie actually received a Step2 desk from a friend for her 2nd birthday. She used (and abused) it to the fullest and it is still in great condition. It currently resides at grandma's house for Mason to learn how to draw. She (and Mason) love the new Step2 Studio Art Desk and they will have so many great memories drawing and painting together! Two-in-one art studio meets all of your creative and storage needs! Removable supply cup for brushes, pencils, markers, etc. Chair included <---- this is an awesome chair and Mason needs one of his own! Check out my video review of the Step2 Studio Art Desk! 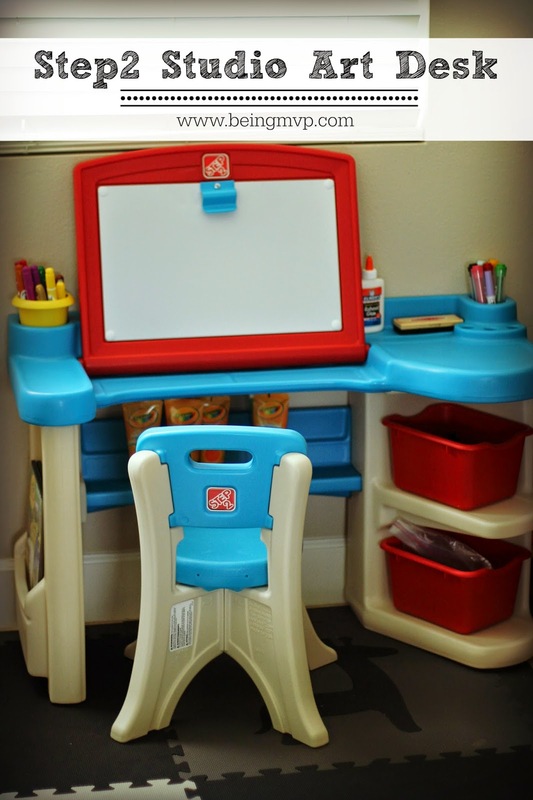 One winner will Receive a Step2 Studio Art Desk! I Like The Storage Space On The Side Of The Desk, My Niece Would Love This Desk! I like the folding surface and that my son will be able to use it for a long time as he grows. I like that there is a place for everything and has great storage/organization. This would be for my son. I love that it is easy to put together and the side storage bins are a great addition! My favorite feature is the storage bins! How nice! This would be for my grandsons to share! I like that it can be used for a desk or an easel! Oh and it would be great for dd! My daughter would LOVE this. I like the ease of putting together, the storage space and the design. Very Nice! I love that the top part folds down for a desk or stays up for painting. My kids would love this. Thanks! I love all of the storage. This would be ideal for my daughter homeschooling. This would be for my daughter and I love the storage on the side and the pencil holder. I like that it has storage bins. Adorable video!!! I love all the storage it has, and also we love the dry erase board!!! My little miss would love it!! I would love to have this for my 2 children! I love all the handy little spaces & bins where you can stash the extra paper or other supplies! My favorite feature was that you can flip over the desk and it turns into a dry erase board! I like the storage bins and ,y daughter would absolutely love this! I like that it Features an adjustable work surface board; fold down for a desk, or lift up for an easel. My boys could really use this! I really like all the smart storage, especially those bins that are tucked out of the way. I like the built in storage concepts- cup for crayons, and so on. I like the side storage for paper. I love that it has such a great organization system! The side storage bins are great! This would be an awesome gift for a niece or nephew, or to hang onto for ourselves! I love the storage bins and this would be great for my grandson. He loves to color and draw. First of all I love the size. It's big and roomy. Then I like the side bins and storage spaces. My grandson is starting pre-school this year and he would love to have desk. i love all the storage and the cute little chair! this would be perfect for my daughter for my birthday. she would love this! I like all the storage room! My son and daughter would love it! My kids would love this and I like that it comes with extra storage space. I like the storage on the sides. The storage bins are by far the best!! My daughter loves arts and crafts, coloring, stamps, painting and being creative. She would Love this so much! Never destroy a child's creativity is my motto! I would use this for my 7 and 4 year old! and I love the extra storage space! I love that it has storage! You can never have too much storage for kids' craft stuff! This would be for my daughter, who is about 2 and half. I love that it has the storage on the side and a place to hold pencils/markers and I would give it to my son. I love the size and all of the storage. My son would love this! I love the adjustable top!! I love the storage, and this would be for my daughter. I really like all the nooks and crannies for storing annoying artsy craftsy items :) It would be for my son. I love how many compartments it has for storage and organization! My kids would absolutely love this. i like all the storage like storage bins. hi, soooo much storage, kid-sized, even a cup-holder!! I love everything about this desk, but I love most that it has so much space for storage, and that it can flip up into a dry erase board and easel. I love how much storage there is! And I love the adorable models, lol! I love the storage feature and it is a really nice size! My son would love this!! Wow I love all of the storage space! Especially for all the pads of paper! My almost 3 year old son would LOVE this! i love that it has all the storage. my son would love to store his crayons in it! I like the built n storage. This would be for my grandson. both my little ones would love this! and i love that it can be a desk or and easel! That it folds down to a desk and up for an easel. Durability is great too so it can be passed down from my oldest to youngest when shes ready. I love the size of it and I also love the paper holder. This would be perfect for my grandson, who is starting kindergarten this year. My favorite feature is the large work space, this would be for my youngest son. I like the flip top for the dry erase board. My nephew would love this. My daughter would love this desk. My favorite feature is all the little compartments / grooves to store supplies. I really love the storage to the side of the desk! My son would totally love this! I love the flip up desk lid that also holds paper like an easel. My favorite feature is all of the storage. Especially for the markers and paper. If I won, I would give this to my son! I like all the great storage spots for keeping supplies. This would be great for my son to do his homework and art projects. I like all the storage options for all types of art supplies. I'd give it to my kids. I like the paper storage slot on the side the best. It would keep paper neat for us. This would be for for my preschool age granddaughter. I love all the storage....this would be great for my grandsons! I like how much storage and space there is to put various utensils/items. I'd love this for my son. i like all the storage that is available and i believe my daughter would love this. I love all the storage it offers. I would love this for my daughter. I love all of the storage that it has for art supplies. I like the space that it offers. There's plenty of places to put everything and children still have plenty of room to make masterpieces. the shelves are my favorite part of this! I like the storage and desk options. This would be for Mt two boys. I like the easel that flips up! My niece would love to use this desk! 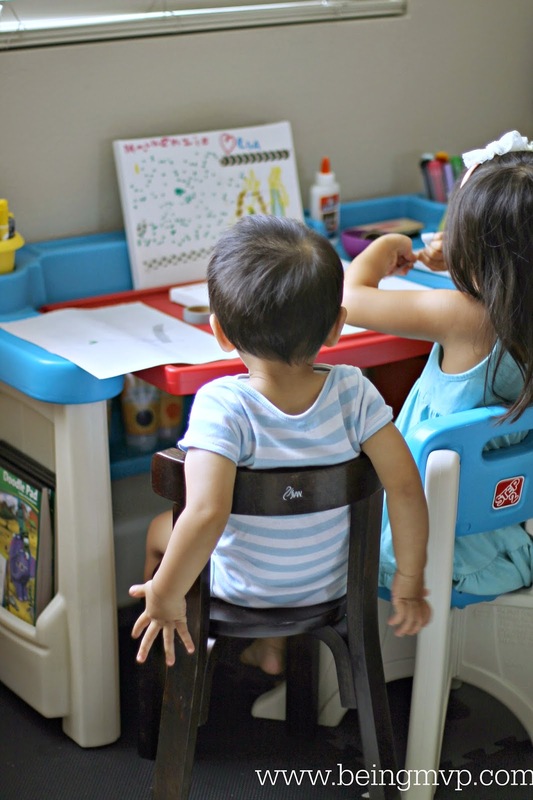 I love that it can be used as an easel or desk and all 5 of my kids would love this!